In response to the heckling of Prime Minister Viktor Orbán’s speech on Sunday, Fidelitas president László Böröcz and vice-president Zsófia Koncz announced the launch of a “left=wing political provocateur watch team” to collect and post the names and photographs of “known left-wing provocateurs”. Standing side by side at separate podiums proclaiming “Hungary is doing better”, the two Fidesz youth movement leaders delivered carefully scripted speeches accusing the “left-wing” political opposition of deliberately disrupting official March 15 celebrations. 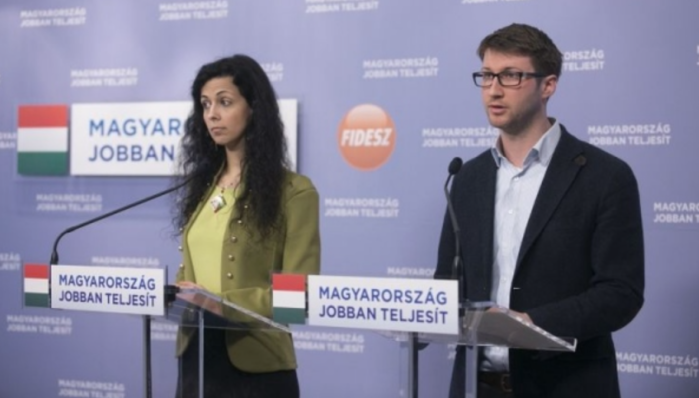 The two Fidesz youth leaders went on to “name and shame” as “provocateurs” Nikoletta Henrietta Antal and Gábor Szabó, identifying the former as a MSZP candidate for Budapest District 3 city council in last year’s municipal elections, and the latter as a “DK activist” (Democratic Coalition) from the same district. Böröcz announced that Fidelitas had established a “provocateur watch group” and was launching a Facebook-like directory of known left-wing provocateurs. He then issued an appeal to Fidesz supporters to send the names and photographs of suspects to provokatorfigyelo@fidelitas.hu. In anticipation of criticism from civil rights defenders, Böröcz noted that “knowledge expanding and familiarity distributing” services were “nothing new” because “similar means” had been employed by independent media outlets cink.hu, 444.hu, and atlatszo.hu. Together’s Y-Gen and Dialogue for Hungary’s (PM) youth organizations reportedly responded to the announcement by filing complaints with the police. On Tuesday evening independent MP Ágnes Vadai (DK) told ATV “the young Fidesz group is extending a helping hand to its government by setting up its own ÁVH in hopes of providing a service”, and that the Putin-esque use of power in Hungary had just reached a whole new level. The ÁVH, or State Protection Agency, was Hungary’s secret police force between 1945 and 1956 whose excesses were largely responsible for triggering the 1956 Uprising in Hungary against its Soviet occupiers. “Provokátorokat” lehet feljelenteni a Fidelitasnál névvel, fotóval, HVG.hu; 18 March 2015. Letette névjegyét az új Fidelitas-elnök, Origo.hu; 18 March 2015.